They amuse you, your kids ...and us! ;-) We love to create new characters and worlds for more Happy Touch Entertaining- and Learning-Games for kids. But parents should not have to worry about kids and their safety! Thats why we create 100% child-oriented Apps. We promise, that all Happy Touch Apps are made without advertising, push-messages and hidden costs. Because of our helpful age recommendations, you'll easily find apps for your children! The best: You can test all apps for free. In addition, latest apps have a parental gate for in-app purchases and external links. 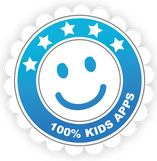 Based on these „Happy Touch-Commitments“ we can provide you 100% Kids-Apps! Read more about the Happy Touch-Commitments here. Do you have any questions about our commitments or kids-apps in general?